The original and best Global Community portal - with search engine, links to sites and news, press releases, action alert, educational and training programs, scientific evaluations, business assesments and support, workshops and global dialogues, and more! Global Dialogue 2006 is a project of the Global Community. But you do not need to wait until year 2006 to participate. Participate now, today! Here is how the process works. Certified Corporate Global Community Citizenship Help Tsunamis victims, victims of Hurricanes Katrina and Rita along the Gulf Coast, and victims of land slides, forest fires, earthquakes and terrorist attacks. Help victims in all parts of the world. 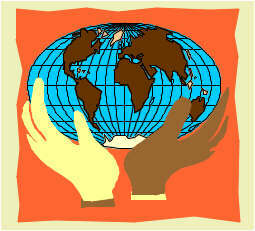 Within each Global Ministry there is a section about the 'Global Community Overall Picture' which describes the situation in all nations of the world and we divided the world in five different regions: North America, Countries in Latin America & the Caribbean, Africa, Europe, and Asia & Oceania. Each global ministry has a description of what is happening in the different regions. There are actual facts about what is happening in the world about all issues we have discussed during global dialogues in years 2000, 2002, and 2004. Issues of global dialogue 2006 are also included in this project. Our work is too create a plausible scenario(s) of what the world is now and what it could be between now and a not-so-distant future. The Global Community Assessment Centre (GCAC) is the assessment Centre for the Global Community. GCAC conduct scientific evaluations and assessments to give suport to businesses and communities. It was created to give individuals and organizations help about negative events happening in their communities which cause concern to people, resources, industry and the environment. GCAC is also the Centre of assessment of local and global indicators which will result in giving the Global Community a sense of direction to ensure a sound future to life. GCAC is about the restoration of the planet, our home. GCAC has integrated a body of scientific information based on formal assessments such as those on Biodiversity, Climate Change, Human Development Report, World Development Report, struggle for Human and Earth Rights, life species Conservation, Health, Economic Analyses, Commission on Sustainable Development, etc., which have bridged the distance between incomplete science and contentious policy. building global symbiotical relationships between people, institutions, cities, provinces and nations of the world.